By setting the appearance, alerts can have different colors. Turning dismissable on will add an x to the control. Clicking on it will cause the alert to be hidden, and your app will reformat to use the space which has been freed up. badge Adds a Badge to the alert. dismissable Add an x to dismiss the alert? value The title of the button. HTML OK. Design time or runtime. 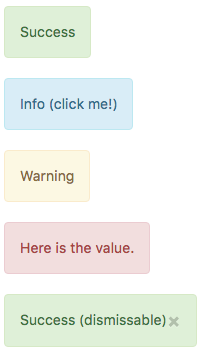 MsgBox "You can display a message or take other action when clicked"
This page was last edited on 22 March 2019, at 16:27.